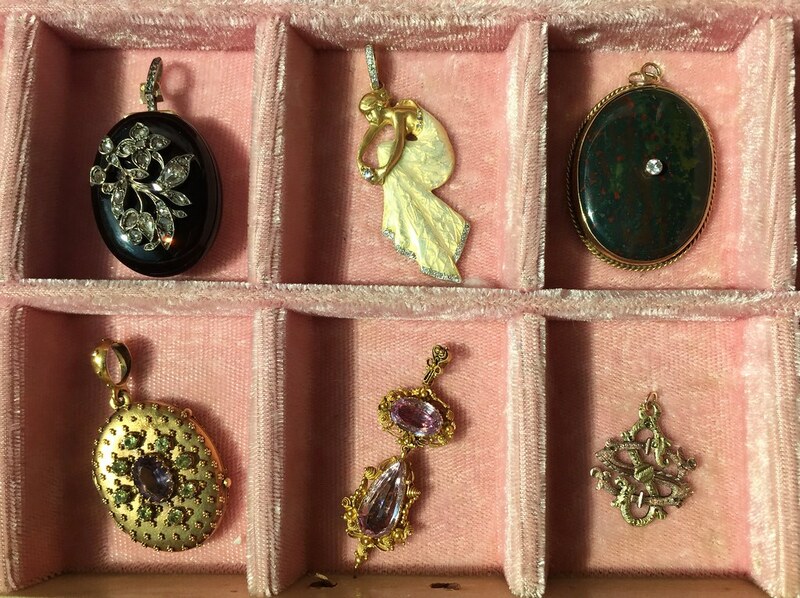 At my father’s house, in a closet on a high shelf, is my original jewelry collection: giant, dangly, geometric earrings from the ‘80s; slap bracelets in various colors and prints; vintage gold plate and paste treasures gifted to me from my grandmother’s collection; unicorn pins—-so many unicorn pins…; and a month’s worth of enameled ear studs in every imaginable shape and color, all arranged neatly and lovingly in a purple, plastic container. My mother was a geology professor and I was exposed to rocks and minerals from an early age, so in addition to my avid unicorn collecting I enjoyed visiting the empty pit next to my house and picking rocks. I once found a rock that looked like a chewed up piece of gum; it was gross and I was delighted. As an adult, my tastes have definitely evolved. I don’t wear earrings as often as I used to and none of my bracelets glow in the dark, but I still love rocks and minerals. 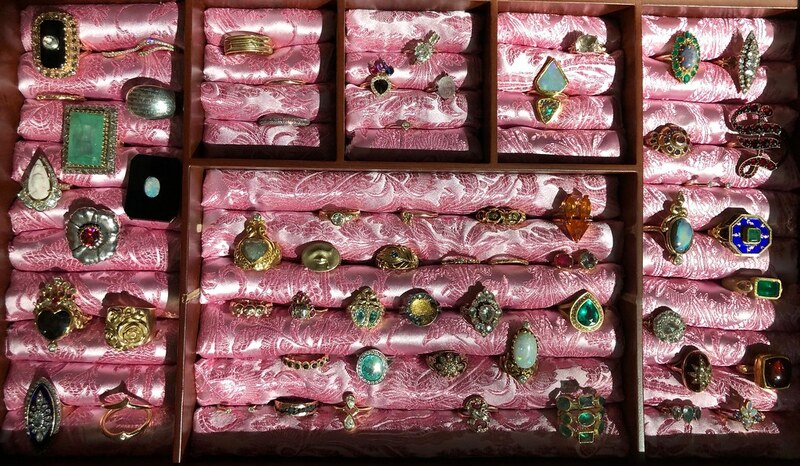 My current collection consists of mostly rings. 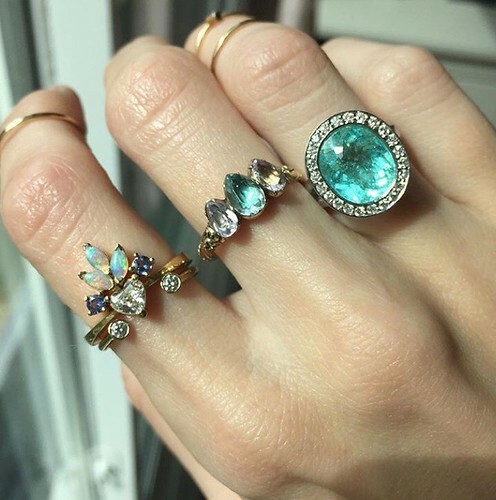 In addition to super large cocktail rings (the larger the better!) I always wear midi rings on several fingers and usually a finger chain too. I hardly ever take off my Bittersweets New York skeleton eternity band—I wear it on my thumb. 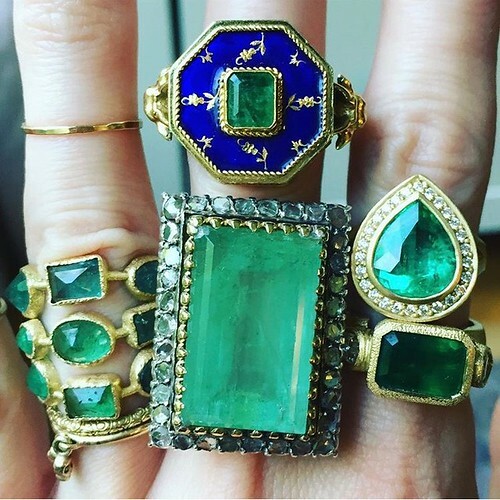 I’m a professional flutist and people always ask me if I wear all those rings while I play. Yes I do! They’re the perfect source of entertainment during rests and long, tedious rehearsals. 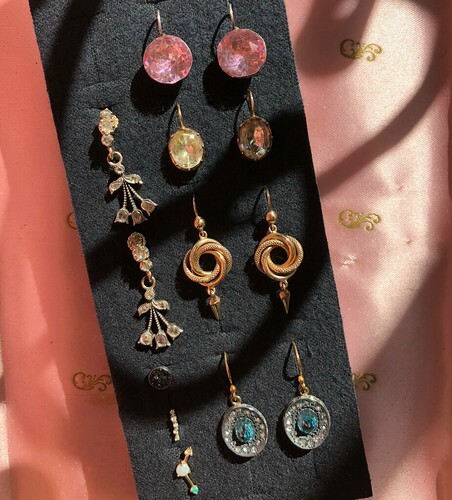 Lately I have gravitated toward pastels like aquamarine, pink topaz and Paraiba tourmaline, though I love emeralds and other bold colored stones too. 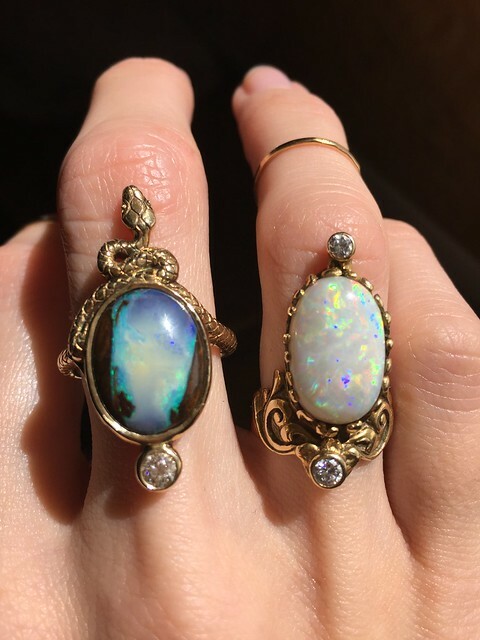 Without question my favorite gemstone is my birthstone: opal. 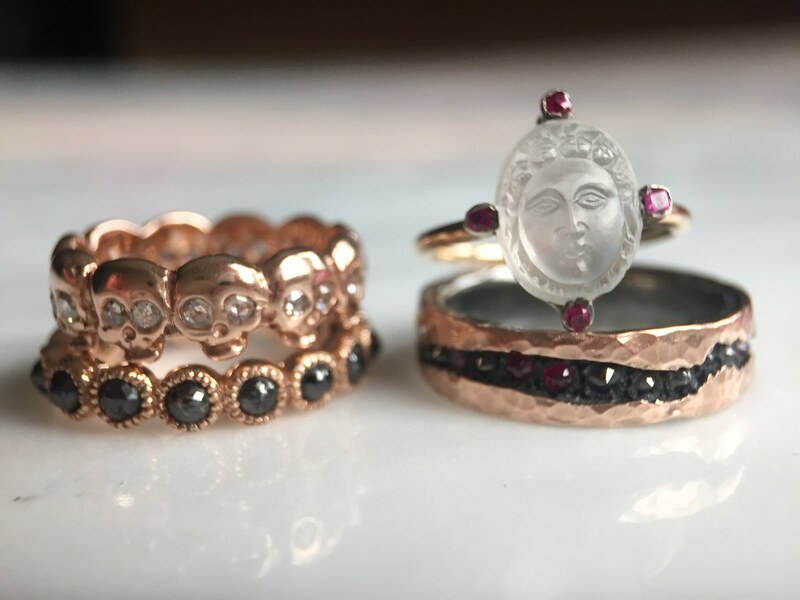 My taste in jewelry ranges from antique through fresh off the bench. 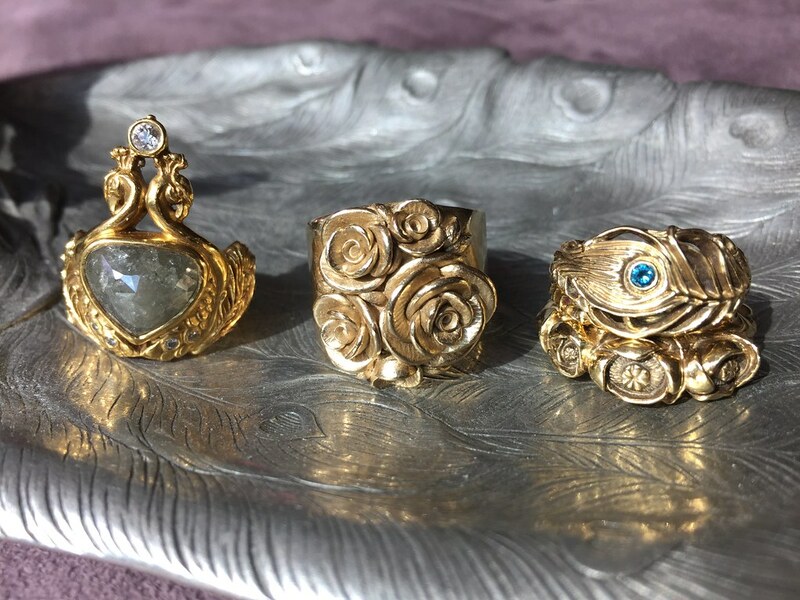 I find the history of old objects fascinating, jewelry most especially as it is deeply personal, having not just been used, but carried around and worn against the skin. 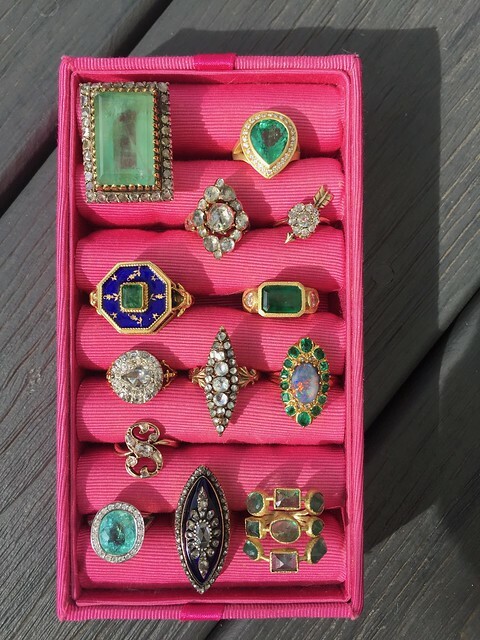 I once visited Mozart’s birth house in Salzburg and there, in a glass case amongst other personal items, was a ring that had belonged to his sister, Nannerl. In that moment she became a living, breathing woman. 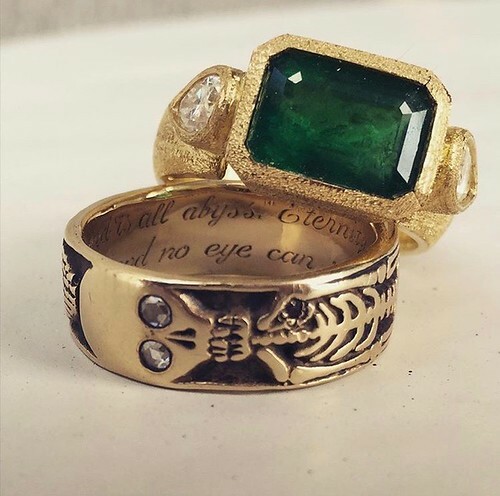 It amazes me that something as simple as a ring can connect people across time. 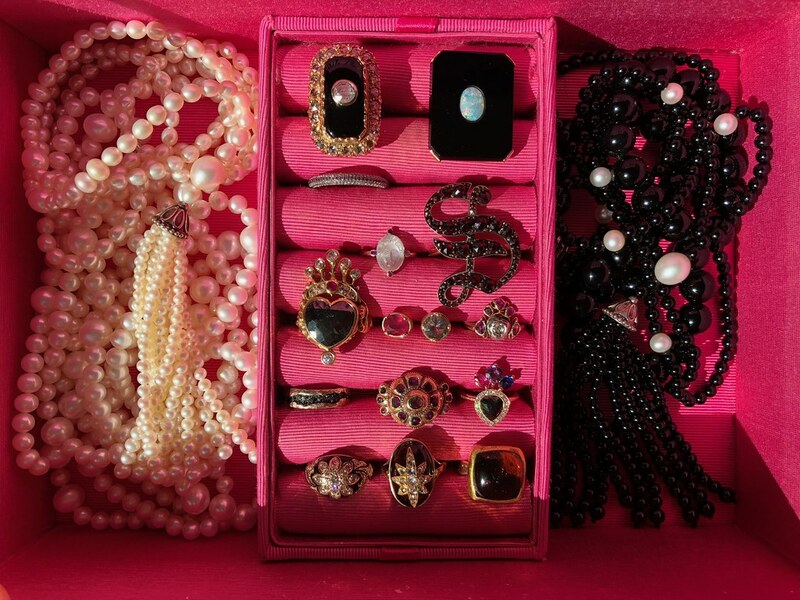 I adore beauty and glamour, and am particularly obsessed with the aesthetic of the 1920’s and ‘30s. I have a beautiful set of hand colored Alfred Cheney Johnston photos of the girls of the Ziegfeld Follies, and a collection of books on the subject. When I found this gorgeous Art Deco paste bracelet, I was smitten. 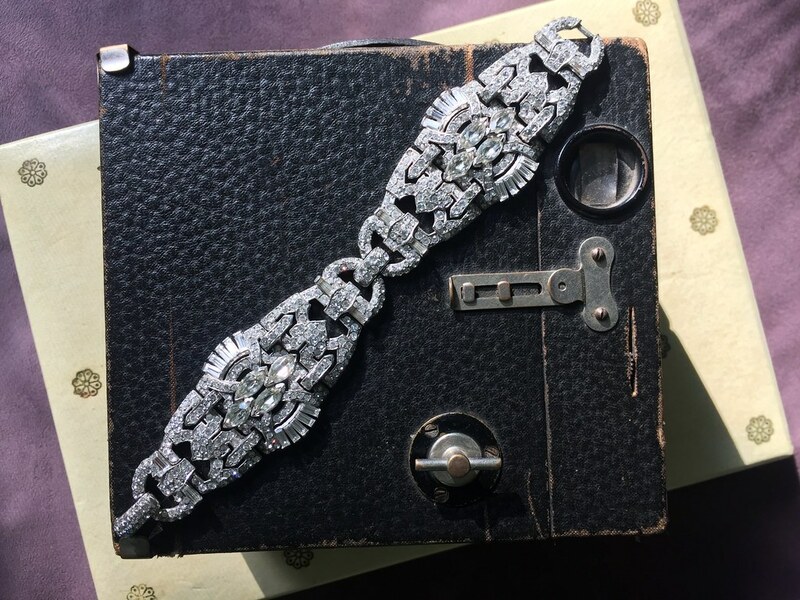 I had an instant connection with the seller and through our conversations she revealed that this bracelet had once belonged to a Ziegfeld girl whose identity was confidential. I got one tip though: she had been friends with the Queen of England. That sent me sleuthing! 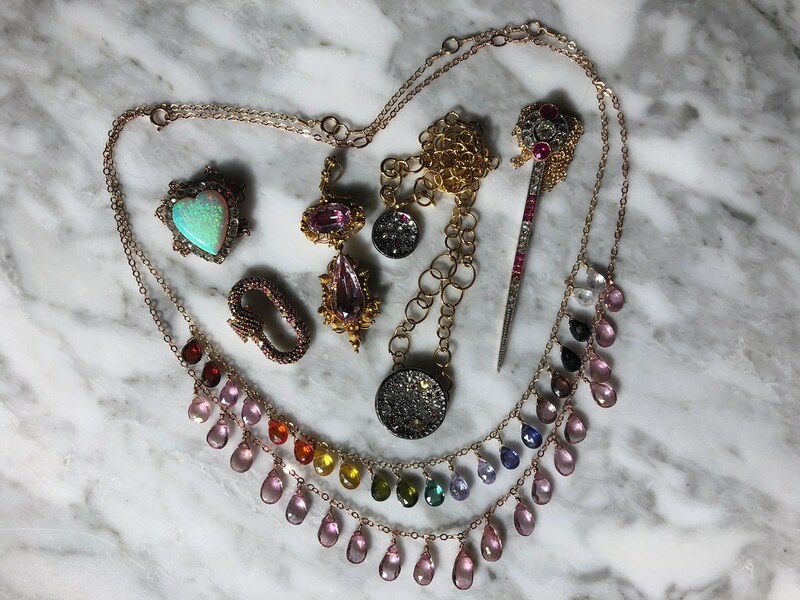 I acquired my beloved Victorian rainbow Tassie bracelet from Laelius Antiques, one of my favorite places to buy antique jewelry. They curate an excellent collection and are extremely nice too! It’s such a joyful piece and I wear it almost everyday. I’ve been following Marla Aaron’s work for a long time and finally acquired my first piece of hers: a multi sapphire lock. It’s delightfully utilitarian—like a confetti explosion in a hardware store. She is an interesting (and fun!) designer to watch. Cheyenne Weil is one of the most gifted artists I have ever worked with, in addition to being smart, kind and funny. I have more pieces by her than any other single artist. 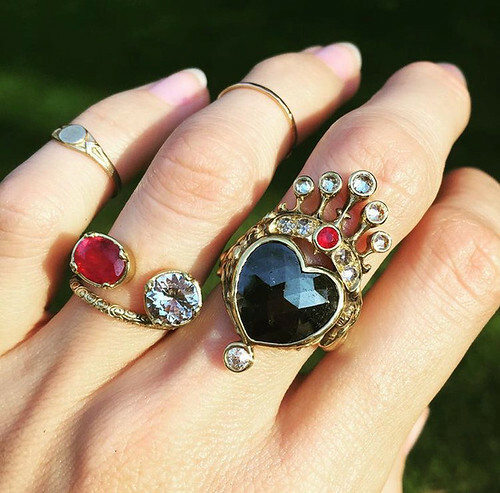 Some of my rings are designs she offers in her shop, and a couple (the double peacock ring and the black diamond crowned heart ring) were designed just for me. I feel so incredibly lucky to get to own and wear her work. I have also had the great pleasure and privilege to know Todd Pownell, the designer behind Tap by Todd Pownell. The first time I laid eyes on his work was at a party for a colleague that was coincidentally held in his loft. 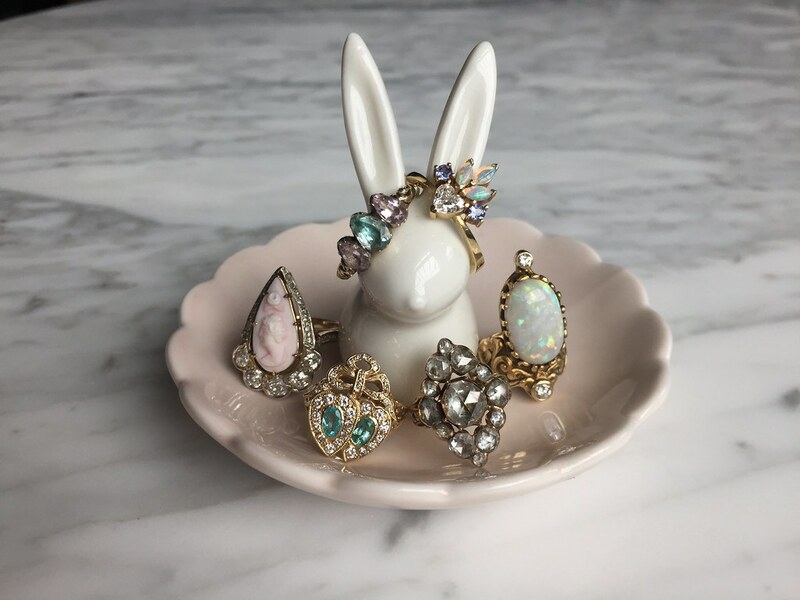 At some point I wandered away to peek in the jewelry cases and saw a ring that blew my mind. I asked every person at the party who made that ring until I found him—I was determined to tell him how incredible he was! And I did. (And yes, I had him make me a ring just like that one.) That was more than a decade ago, and over the years he has been generous, supportive and encouraging to me in all my endeavors. He is a singular artist, a wonderful human, and his work speaks volumes. 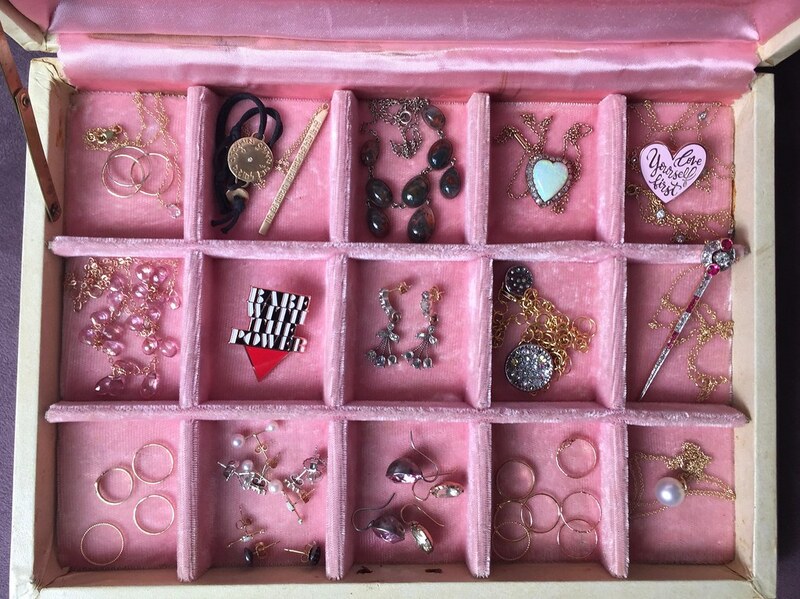 I love jewelry. From old to new, it is capable of expressing a kaleidoscope of sentiments. It’s fun, it’s beautiful, and it’s for everyone.